The pimp daddies at VH1 have extracted every conceivable penny from the sequined clutch of its "I Love the (Decade)" whore. ("I Love the '80s ... 3D"?) And now they have set their sights on conquering one-sixth of the entire Gregorian calendar. "I Love the Holidays" focuses on the period from Halloween to New Year's Day. In fact, probably half of the show focused on Halloween, which was old news more than three weeks ago. I was about to note that the "celebrities" chosen to riff on the indignities of sitting at the kids' table are so far down on the list that they need an express elevator to get to the D-list, until I saw that my friend Stephanie D'Abruzzo was among them. Oops. The "celebs" came down hard on "turducken," which is possibly the most delicious thing I have ever put in my mouth. I'm serious, it was like crack for my tongue. They also managed to get in a few Rick Sanchez-esque comments about fruitcake. Just like "Law and Order," ripped from the headlines. MalcoVision has a nice, steaming chunk of holiday cheer for you. For those of you who are Avenue Q fans (like me) but not in New York (unlike me), it might either gratify you or piss you off that the Tony-winning puppets have sold out to cross-promote a new anchorman at WCBS-TV. [S]o many people still see me as only a puppeteer. 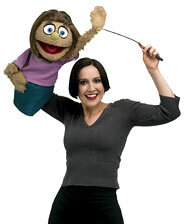 People have actually asked me, "Can you sing without the puppet?" I can't take myself too seriously. I walk out the stage door that shares a service entrance with the Milford Plaza. So I leave the theater every night surrounded by garbage or laundry or mattresses. Perhaps it is not an irony that one of our first and most indelible memories of Stephanie was weeping together with her the day Jim Henson died. For one who was practically a citizen of Sesame Street, it was a very sad day indeed, as if a family member had died. It was also the first and only time The Malcontent has wept at the death of a celebrity, although we do recall getting a good lump in our throat over the passing of Fred Rogers. Stephanie always was the frenetic, highly creative kind. We thought her life would take either a downward or a very sharply upward trajectory, but probably not anything in between. We are glad to see that it was the latter, and even happier that she has apparently found her purpose.